used in camping, tenting, military,travel etc. 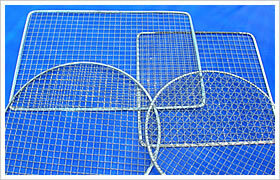 Barbecue grill wire netting is based on crimped wire netting, surface treatment with zinc coated or chromium plated. Barbecue grill wire netting enjoys bright color and good structure. Characteristics: Bright color, good structure, export standard .